Krrish 3 does a brilliant job of turning an age-old cliché on its head - the protagonist, a shining example of all that is good, is dressed in pure black while the antagonist, a not-so-shiny example of evil, is dressed in white armour. But for this one instance, however, the movie religiously and zealously (sometimes over-zealously) follows every other cliché in the Rakesh Roshan book of filmmaking (a book with around 5 pages in all). Krrish 3 is also a lesson in product placement - how to be nauseatingly obvious in placing products in your movie, that is. The film has a range of products - from Bournvita to Forever Jewelry to Flair pens to Del Monte - that constantly pop up at various places, and the camera either lingers over the brand name for a few extra seconds or is placed in such a manner that the audience have no choice but to see the brand name. The family promotion is also in full swing, with Suzanne Roshan's store getting prominent screen time in the climax. The film takes off with a brief flashback giving us the gist of Koi Mil Gaya and Krrish (so there's no problem if you haven't seen those). It shows Krishna aka Krrish (Hrithik Roshan) trying hard to blend amongst normal humans when he's not wearing his superhero suit and failing spectacularly at it, and pulling off some spectacular stunts in his superhero suit. There are also Rohit Mehra (Hrithik Roshan), Krishna's father and scientist par excellence, and Priya (Priyanka Chopra), Krishna's pregnant wife. The trio is up against an evil villain Kaal (Vivek Oberoi) and his army of manwars (mutants born from a combination of manav and jaanwar - really, we ain't kidding). Kaal is paraplegic but incredibly powerful - sort of Stephen Hawking with tele-kinetic powers. Kaal is searching for the perfect bone-marrow match for himself so he can start walking and wreak destruction on the world. 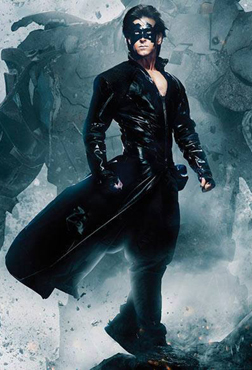 Krrish's battle against all odds to save his family and the world, while ensuring that his costume and mask remain intact, form the crux of this installment of the franchise. Krrish 3's biggest problem lies in the amount of build-up the movie indulges in. The film shows us an entire breed of mutants - rhinoman, antman, cheetahwoman amongst others - who act as nothing but props. Neither are their powers used anywhere nor are they part of any good stunt sequence. A deadly virus makes its presence felt several times but is almost immediately cured each time it appears. The villain threatens to destroy the entire city of Mumbai, but hardly manages to kill a soul. All the build-up to big conflicts is resolved in no time at all, leaving you with a sense of dissatisfaction. The other problem is the moral science classes the movie indulges in. Apart from marketing Krrish bands and merchandise, Hrithik Roshan delivers the "do not try these stunts at home" message in person. Which brings us to the man himself - Hrithik Roshan flaunts his unusually sculpted torso several times in the movie drawing gasps around the theatre (whether they are for the perfection or the weirdness, remains to be seen). He is brilliant in both his roles as the father and the son, but he definitely needs to cry less in his movies. Priyanka Chopra is shrill and plastic, and you are left wondering where the actress who made her debut in Aitraaz has disappeared. Vivek Oberoi's evil villain turn is hardly menacing. Kangna Ranaut gets good screen time and bad costumes. There is hardly anyone else worth mentioning. The much hyped VFX are decent in places and of the make-do variety in others. Rajesh Roshan's music is bad and Salim Sulaiman's background score keeps rising to a crescendo in every other scene whether or not it is necessary. The attempt to create an Indian superhero is absolutely laudable, but Rakesh Roshan packs enough gore and cleavage to make the movie unsuitable for children. Krrish 3 only ends up showing us how Indian masala movie sentiments do not mix very well with Hollywood-style superhero stories. Such a pain in the a55! fullhyd.com has 700,000+ monthly visits. Tell Hyderabad what you feel about Krrish 3!